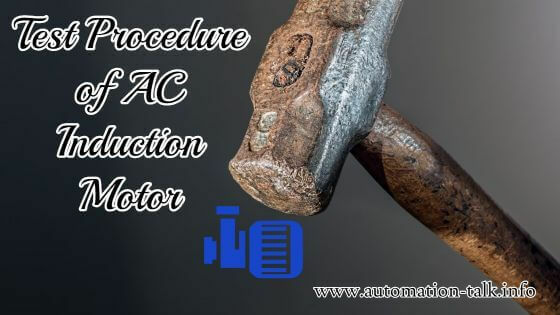 As we buy the AC Induction Motor from the market, it has been tested previously at the manufacturing time for all the defects, But still, we should also know and understand the testing procedure of AC Induction Motor. We will see step by step testing procedure here for AC Motor. Magering:- Mager is used to test the Insulation of the Motor. But what is Mager?? upto 2000V it is hand operated and above 2000V it is mechanically operated. The resulting outcome equation is as:- 1mohm / KV and 0.44mohm / 440V. Drop Test:- Drop test is used to check the resistance of individual winding, and they should be equal for a more efficient AC Motor. <> Absorption Coefficient Test:- It is same as Magering procedure. In this test procedure of AC Induction Motor, Insulation value is measured for two different time duration one for t=15 sec and other for t=60sec. If Insulation Value for t=15 sec is less than 1 then AC Motor OK. If Insulation Value for t=15 sec is greater than 1 then AC Motor NOT OK. So It may be possible that moisture is present in the Windings of AC Induction Motor, To remove the Moisture from the Motor Windings, Raise the temperature of motor windings gradually so that all the moisture evaporates out. But one point to keep in Mind is that the rate of change of temperature of Motor Windings should not be greater 1 deg. celcius per 30 minutes. After removing the moisture from the motor windings again perform the Absorption Coefficient Test and if this time Insulation Value for t=60sec is less than 1 then AC Motor OK. If you like this article, please Subscribe to Automation-Talk by Email and share this article with your friends. You can also contribute to our blog, just let us know through Facebook or commenting below.